Liane Moriarty, top ten bestselling author of The Husband's Secret, imagines losing the most important ten years of your life in What Alice Forgot. Alice is twenty-nine. She adores sleep, chocolate, and her ramshackle new house. She's newly engaged to the wonderful Nick and is pregnant with her first baby. There's just one problem. 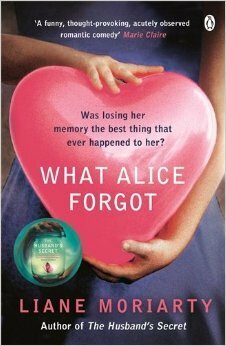 All of that was ten years ago...Alice has slipped in a step-aerobics class, hit her head and lost a decade. Now she's a grown-up, bossy mother of three in the middle of a nasty divorce and her beloved sister Elisabeth isn't speaking to her. This is her life but not as she knows it. Clearly Alice has made some terrible mistakes. Just how much can happen in a decade? Can she ever get back to the woman she used to be? "Gripping, thought-provoking and funny". (Marie Claire). "The perfect holiday read". (She). "A call to embrace life". (Easy Living). Liane Moriarty is the bestselling author of five novels, Three Wishes, The Last Anniversary, What Alice Forgot, The Hypnotist's Love Story and most recently the top ten bestseller The Husband's Secret, as well as the Space Brigade series for children. She lives in Sydney with her husband and son.